Meet one of the most energetic and innovative comedians to come your way. His slant on life will make you see things that you've always thought of, but were afraid to laugh about. He is self-described as an Army vet, actor, musician, substitute teacher and bad credit risk. This is where most of his material comes from. He observes everyday life and takes it to the stage. Don't be surprised if something in your life appears in his act. Kurt's stage presence enables him to entertain all a view more.. He is self-described as an Army vet, actor, musician, substitute teacher and bad credit risk. This is where most of his material comes from. He observes everyday life and takes it to the stage. Don't be surprised if something in your life appears in his act. Kurt's stage presence enables him to entertain all age groups. The show ranges from stand-up to musical songs and parodies. He has appeared on BET's Comicview television show for five consecutive years and was selected as a semi-finalist for the " Laugh Riots" comedy competition for the Comedy Central Network. 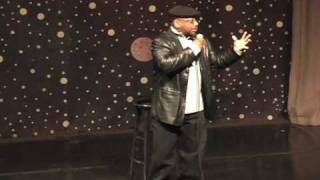 He was also picked to appear in the Uptown Comedy Festival held at the Apollo Theater in New York City. Kurt has performed at some of the premier comedy clubs in the country including "The Stardome Comedy Club" and Zanies Comedy Clubs. He has performed at colleges, casino's and military bases across the country. A partial listing of venues can be seen below. "I want to thank you for stopping by and checking me out. If you have seen a show, email me and tell me what you think. I answer all my emails. Please stay tuned to find when I'll be performing at a venue near you."